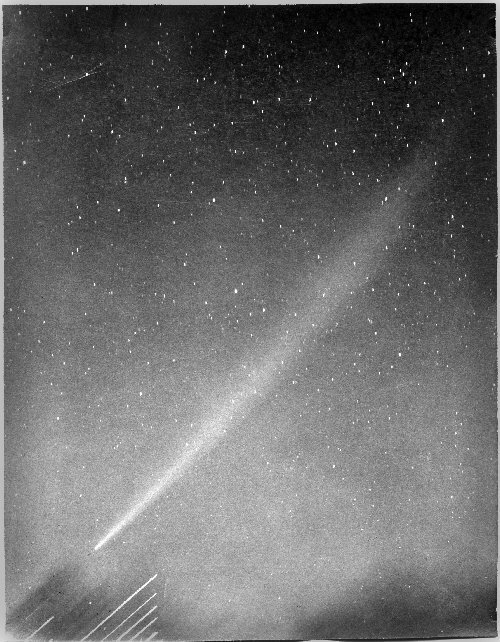 I saw my first bright comet (Mrkos 1957d) hanging over the summits in a purple, crystal clear and darkening sky in the Tetons in August of that year. We had to run several hundred yards east, away from the peaks, in order to raise it above the summit ridges. I thought how much fun it would be to be able to photograph (or even to discover) such a one. 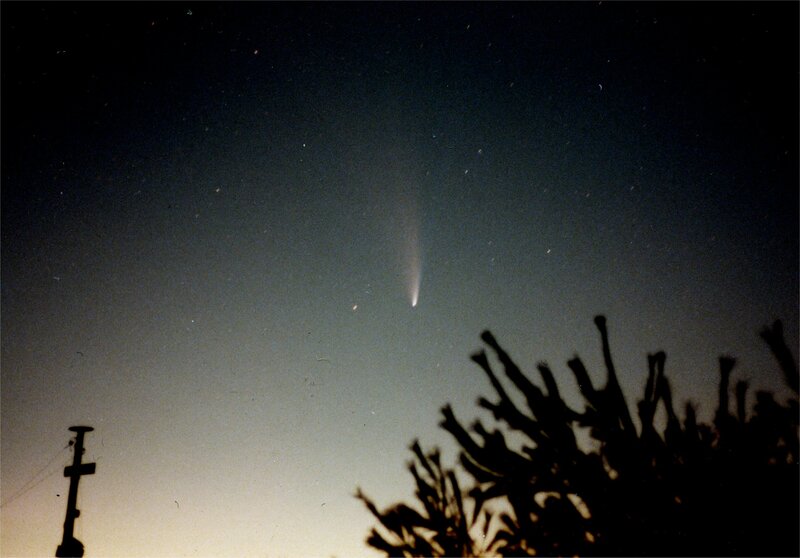 My attempts at comet photography began in 1959. In order to learn well in advance of new arrivals I subscribed to the Harvard Observatory announcement cards. At first with the 2-1/4 x 3-1/4 camera with eyepiece projection (tiny, tiny images bearing gross enlargement), and later with a new camera (independent of the telescope) assembled from an army surplus aerial lens of much longer (250 mm) focal length with a homemade 4×5 plate holder at the back and permanently focussed with a bright star (Sirius) using a knife-edge installed across a small hole made in the ground glass in the film plane. Eventually I added hand operated slow motion knobs to the right ascension and declination circle adjustments and red-light illuminated cross-wires to the guide telescope thus greatly facilitating the removal of driving clock errors in hours-long exposures. The intermittency of the escapement gave a slightly muddy, halting motion to the clock. The guide scope axis is not parallel to the camera axis because the guide object is not necessarily the comet itself. Among the earlier photos were comets Burnham (1959k) from the roof at 300 West 116th Street, Seki-Lines (1962c) from Dobbs Ferry, NY, and later Ikeya-Seki (1965f), Bennett (1969i), and West (1975n) from the yard in Weston, Mass. 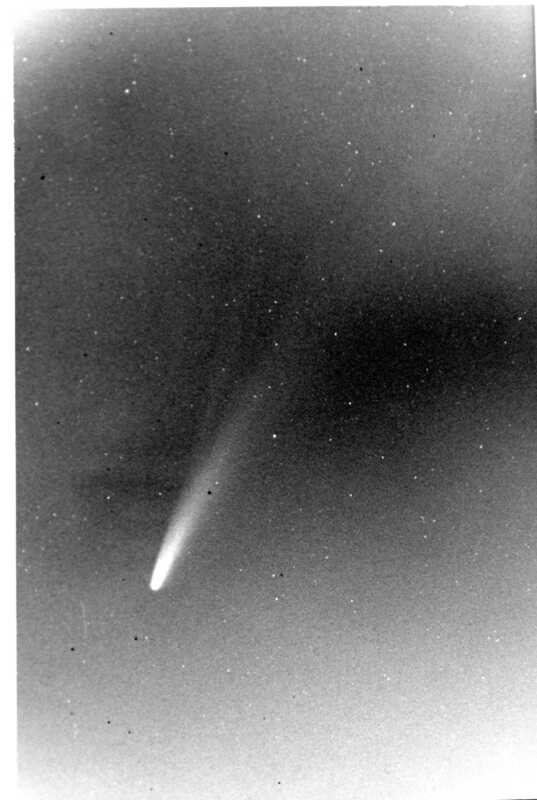 The best, though, was comet Ikeya-Seki (1965f) whose tail faintly swept the entire eastern sky from horizon to zenith before dawn at the end of October. With exposures as long as 30 min (in freezing cold) I was able to get some good pictures with the aerial camera lens. I developed the negatives at night in small enamel trays on the ping-pong table in the darkened basement.